NASA's next space shuttle crew arrived at Florida's Kennedy Space Center on Monday for a dress rehearsal of the late August launch of a mission to restart construction of the international space station. They were to participate in a practice countdown that culminates on Thursday with the six astronauts climbing into the shuttle Atlantis and strapping themselves into the seats they will occupy at launch, currently targeted for August 27. 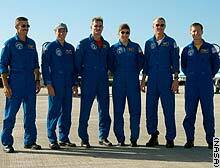 "We're very happy to be here," said astronaut Brent Jett, the commander of the five-man, one-woman crew. "We'll be real anxious to get back here at the end of the month." Assembly of the half-built $100 billion multinational outpost has been on hold since before the 2003 Columbia accident. After shuttle Discovery made a successful flight to test safety upgrades last month, NASA cleared the way for the first of 16 shuttle missions planned to complete the station before the shuttle fleet is retired in 2010. Atlantis is scheduled to deliver what will be a second set of solar arrays for the station, in preparation for increased power requirements when partner laboratories from Europe and Japan are installed beginning next year. NASA managers plan to set a firm launch date following a flight review on August 16. In addition to Jett, the Atlantis crew includes pilot Christopher Ferguson, flight engineer Dan Burbank, the Canadian Space Agency's Steven MacLean and astronauts Joseph Tanner and Heidemarie Stefanyshyn-Piper. Ferguson and Stefanyshyn-Piper will be making their first flights.